So this time I turned all the Ace RTP icon’s graphics into a usable format for events and maps. 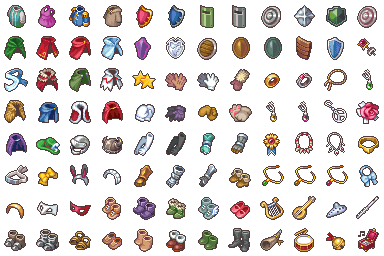 Now honestly I can’t think of any game idea that could possibly use all of these, but I’m crazy and I like to do everything just in case. They’ve been reduced so they don’t take up as much room on the screen so make sure you open them in another tab and save the image from there otherwise the image will be to small and not work. 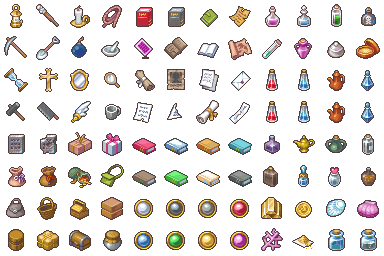 First up are the icons, centered on 32 x 32 grids and thrown on to standard character sheets, so you can use them for on map item drops, which someone might do for a touch encounter game or an action game I suppose. You’ll want to make sure you turn direction fix on and turn off walking/ stepping animation. 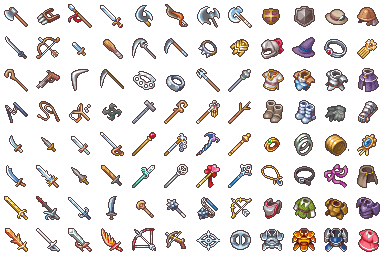 Second is the icons put on tilesets for people who could think of a possible use for such a thing. 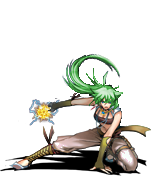 I’m thinking later on I might do floating icons because it wouldn’t be hard, but it will take a bit. Anyways have fun, make games! I’m open to suggestions, if you have any. Lunara made some handy statue edits. Great for puzzles and general decoration. Molegato shows us some more art from his game – Instead of Dreaming. Damn this game looks to be so cool. Sourve isn’t dead and is starting to take suggestions again. Check out the site if you haven’t before (lots of good graphics) and suggest something.